Designed to work magic with tricky eye shadow textures—think shimmers, metallics, and creams—Smudger Two is an ultra-soft smudging brush handcrafted in Japan. The short, densely packed natural bristles pick up the perfect amount of product and distribute it over the skin without visible edges. “While Smudger One is meant to be used only with powders, Smudger Two can handle both powders and creams and shines with more difficult textures. “ — Sonia G.
Use short strokes along the lashline for extra stability and control. Drag the tip of the brush out beyond the corner of the eye for a soft winged look. I am so impressed with this brush, its excellent. It the perfect balance of firmness and gentleness (bristles) to be the best smudger brush. Its firm enough to use it as eyeliner brush with my powder shadows. * Its so easy to do a wing liner with this brush and powder shadows. Its gentle enough to use on my lash line without making my eyes tear up. Its dense enough to use with cream products. Overall very satisfied with this brush. This brush was advertised as being good for tough to work shadows. I was sold on that claim. As soon as this came I pulled out three or four of my most difficult shadows and was blown away. I did a side by side test with my Sigma smudgers which are my usual workhorses for tricky shimmers. The Sonia G is half the size so it gets into tiny spaces that the sigmas don't. It is also the softest brush in my collection (including the Wayne Goss eye set). It is small but mighty. It picks up so much product just with a single tap into the pan. It's so dense that it lays down faster than the bigger brushes. I did the test on unprimed, textured lids and the Sonia G performed so much better. This is my first Sonia G brush, but it won't be my last. Oh, this little white Smudger Two. It does all it's squirrel sister does and so much more! I finally found the perfect brush for that matte Armany eyetint to apply along the lash line and to actually darken it. I've been eyeing Sonia G's brushes for quite a while. I've been using Chikuhodo for years but can't find an ideal smudge brush from them. I checked the review and decided to give this a try and it turned out to be successful! It is very soft, easy to blend and precise. It's everything I've wanted for a smudge brush. I'll buy more. This is my 5th Sonia g brush I have purchased and it may just be my favourite. Being a certain age I have been struggling to draw a “straight line” on my upper eyelids. I can now only use shadow and this brush is fantastic at doing that. It picks product up effortlessly and deposits it with such ease in one fell swoop. I have had no fallout or patchiness with any of my shadows and it has halved the time I normally take to perfect that line. Awesome little brush. I'm a novice in every sense of the word when it comes to eye makeup. But this brush makes smoking out my lower lash line so easy and always manages to pick up and distribute the perfect amount of product. I have not used the dyed version so I can't compare them, but I use this brush every day. This is the brush I’ve been searching for! 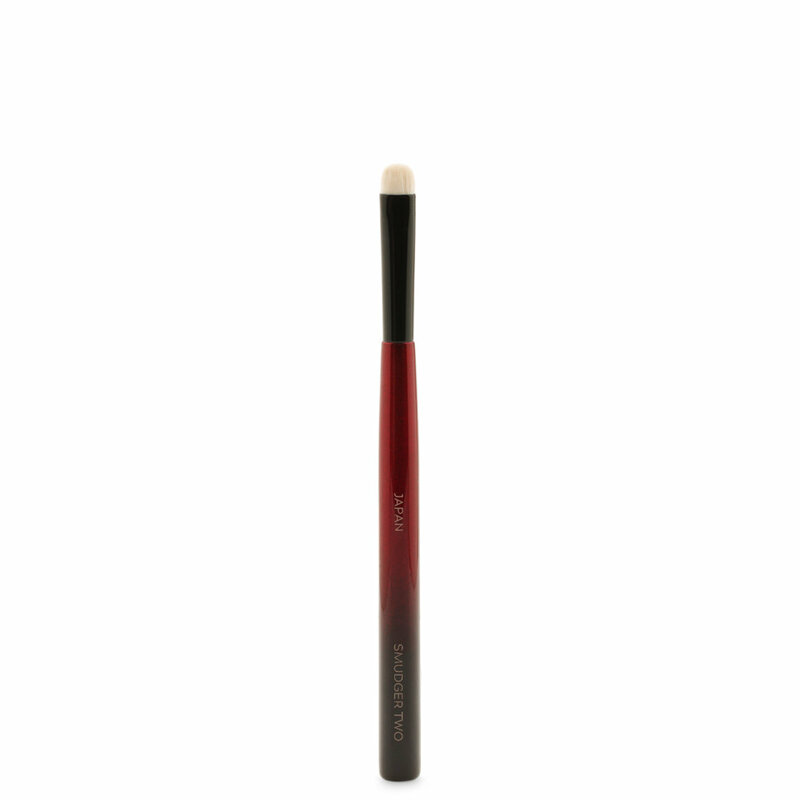 I can use it to deepen the lash line with powder or cream. It’s great for smoking out the lower lash line as well. I tried it with a matte brown powder shadow and in one pass, my lash lines were deepened. Sonia G brushes never disappoint. This one is a staple now for me. I'm so pleased with this brush. It blends almost any type eye shadow very well. I prefer it to my Smudger One brush. Easy to use and versatile. Finally I can do my eye makeup without scratching and irritating the skin around my eyes. Versatile and gentle. Perfect. I was so excited to get this brush but it’s a meh for me. The handle is gorgeous but it’s too thick and too heavy. The hairs are really scratchy under the eye which totally shocked me! So disappointed. Pretty to look at but I won’t be reaching for this.